When the weather is nasty, be it in the early spring or late fall, many anglers miss out on some of the best bass fishing of the year. When their boats are in the garage, and their gear is stored away, other anglers in the know, cash in on some of the best fishing of the year using some special techniques. One of the most effective ways to catch big bass in colder water, is a technique known as “Dead-Sticking.” The anglers who can brave the elements and employ these techniques, catch some of the largest bass of the year. The name of the technique tells it all. The technique actually involves more patience than action. Some of the best ways to present a bait using a Dead-Sticking technique are Drop-Shotting, using a suspending jerkbait, and fluttering soft plastics to the bottom. These are great ways to tempt early season and late season bass. You won’t catch a ton of bass in really cold water, but you can have a memorable day, and catch some of the larger bass of the year. When the water temperature is in the low to mid forties, shad and herring either die off in the winter, or they are so lethargic, that they are a good target for feeding bass. A lure that suspends at the level of the bass, or just falls slowly to the bottom, or in the case of the drop-shot, just sits still in the middle of the water column, offers a tempting imitation of a dying shad. It doesn’t really matter if it’s a tree, or rocks, or next to a dock. The trick is to let the bait sit there for as long as it takes, without moving it all. A lot of anglers are tempted to impart some action to the bait, but this is a mistake. This is the time to wait as long as you can stand it. Nerves of steel are required for this type of fishing. Another good location to use this technique is over old roadbeds, like in Spruce Run reservoir in New Jersey. I also like to use them along bluff walls, and across long tapering points. 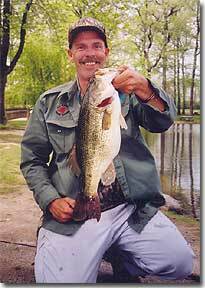 When the water starts to warm in the spring, or after a warm spell in the winter, bass will move up from the deeper water and suspend over or near these areas. 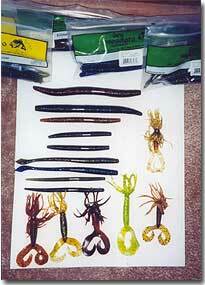 These are ideal baits to use to entice them into striking. 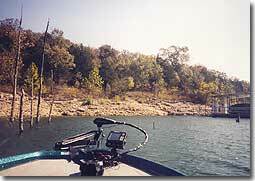 I like to find a long flat point, near a creek channel, where the deep water isn’t far from the shallow water. This is where the bass will be, due to the fact that don’t have to move very far, which is important this time of year, but especially true in the winter. When bass are suspending, if you throw a carolina-rigged bait, you are actually fishing under the bass, if you use a crankbait, you’re usually fishing too fast. This is why suspending jerkbaits are ideal, because they get right down into the suspended bass and stay in one place. This is even more important in the winter, than the early spring. I make sure I fan cast the entire structure from many different angles. Many times the bass don’t hit the bait until it is presented at just the right angle, and you won’t know what that is until you make enough casts to start catching fish. The most strikes occur in about eight to ten feet of water, and suspending baits that go down to about eight feet are the best. You need at least two feet of visibility for dead-sticking baits, and more is preferable. It is very important for them to be able to see it, as you are not moving the bait, and it doesn’t make much noise. My best days deadsticking have been on lakes with a good degree of visibility. Most bass fisherman use Zoom Flukes, Bass Assassins, and other soft plastics, with a twitch, twitch, reel twitch action, like in the warmer months, but using these baits with a dead-sticking technique in the colder water, works wonders. Bass won’t come up and hit these baits on or near the surface when it’s cold, but they do hit it when it falls slowly to the bottom. It takes so much patience to work these baits right in cold water that most anglers don’t have the patience it takes to work them properly. I use the bait on a unweighted 4/0 or 5/0 WG hook, and let it fall slowly to the bottom. The bait only sinks about one foot every three to four seconds, and this is perfect to imitate a dying shad. I have had the best luck with this in the winter, but in the very early spring, it can be effective also. I just cast it out next to the structure, whether it’s a dock, or brushpile, or just over some type of structure that the bass are suspending on. I might twitch it a couple of times as it falls, but not too much, just enough to convince a bass that it is crippled or dying. It is a great bait for areas that have a lot of dying shad in the winter. One of the baits that I have had the most success with last year using these dead-sticking methods, is the Yamamoto “Senko.” This bait is perfect to use dead-sticking. Although it is nothing more than a thin, straight piece of plastic when it is out of the water, it literally comes alive with just the right action to entice bass in colder water. The new “Netbaits” have also worked very well this year, as have the “Bearpaws” “Lazy Sticks”. It is perfect for letting sink slowly to the bottom, or for drop-shotting. Because of the salt content in these baits, it sinks a little faster than an unsalted lure. These baits are perfect for a lot of different situations, as long as you have to patience to let them sink. You really don’t have to do anything to these lures, except let them sink slowly on a slack line. I rig them on a 2/0 or 3/0 Daiichi or X-Point hooks, on fourteen pound test Spiderline Super Mono, or P-Line.The trick is to pay very close attention to the line, sometimes you might feel a bite, but generally you will not. I just move the rod tip a little bit to see if I can feel the weight of the bass. If I can’t, I just let it fall slowly to the bottom again. The action really comes when the bait is falling, so you have to lift the rod slowly, and let it fall back again as you work it across the bottom. There is even a new larger Senko for this year that I am looking forward to using. Even the new Cut-Tail worm may work well in these cold water situations, and I am looking forward to trying them out this year. 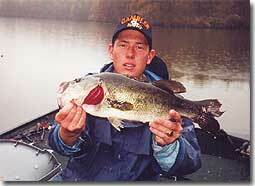 The best technique to come along for cold water or suspending bass is the Drop-Shot technique. Drop-Shotting can tempt bass into striking in the cold water at all times of the year. In the late winter, or very early spring, I just cast it out, let it hit the bottom, and tighten my line up. I use very little action at all. I don’t really shake my rod tip or anything, I just let it sit. fishing in the winter or very early spring isn’t the fishing itself, but motivating yourself to get out there and go when the weather is less than desirable.